Comics Impulse v2: Invincible: The Series Trailer! 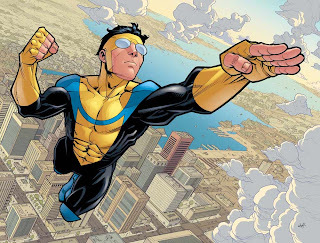 The New York Times reports that "Invincible: The Series," an animated version of Image Comics’ hugely popular superhero title created by Robert Kirkman and Cory Walker will be developed by MTV New Media and available July 22 on iTunes, Xbox Live, MTV.com, MTV2 and MTV Mobile. The show uses actual pages of Kirkman and Walker’s comic book and animates them through a process called Bomb-X. The stories are filled with motion, music and vocal performances similar to those of a traditionally produced cartoon. MTV2 will air an “Invincible” special at 10 p.m. on Friday, June 25. You can watch the trailer by clicking here!